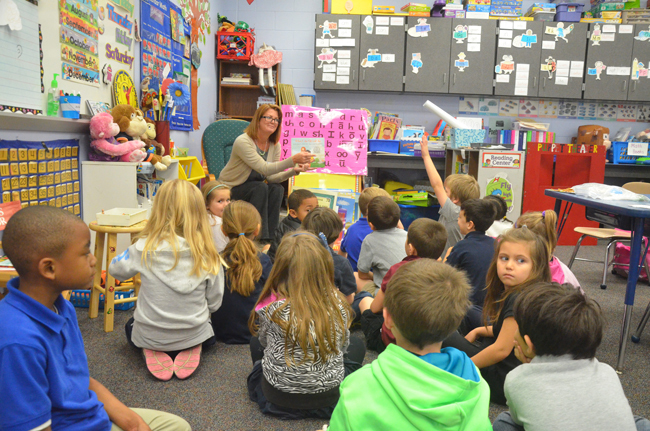 This year’s crop of Flagler County’s third graders have vastly improved their reading scores compared to last year’s, with better scores in every school. The district average of 69 percent of students at proficiency or better exceeds the state average of 58 by 11 points. Third-grade reading scores are key to students’ promotion to fourth grade. Students are graded on a scale of 1 to 5, with 5 the better score, and 3 reflecting proficiency. A grade of 1 can mean retention in third grade, though usually about half those who score a 1 find a way to advance through other means, such as waivers or success on other measures. In Flagler’s schools, roughly about 10 percent of students scored a 1–12 percent did so at Bunnell Elementary and Imagine School (the charter), 11 percent did so at Old Kings and Wadsworth, 9 percent did so at Belle Terre Elementary, and just 8 percent did so at Rymfire. On the other hand, 40 percent of students scored a 4 or a 5 at Bunnell (which has a gifted program), 29 percent did so at Rymfire, 28 percent at Imagine, 35 percent at Wadsworth, 25 percent at Old Kings and 28 percent at Belle Terre. Overall, Old Kings had the most students scoring at proficiency or better, with 75 percent, but every school was at 60 percent or better, which also means that every school in Flagler bested the state average by at least 2 points for an average of 69 percent. Last year, the district had an average proficiency rate of 63, and the year before, the first year the new and at times controversial Florida Standards Assessment test was rolled out, the average was 60. The FSA was intended to be tougher than the Florida Comprehensive Assessment Test known as the FCAT. It also reflects the implementation of Common Core standards. Throughout, however, Flagler’s third graders have bested the state average by comfortable margins. The improving scores reflect broad improvements across the state, and usually happen the longer the same test is administered, as faculty become more familiar with its format and the curriculum adjusts to the new rigors. Just under 1,000 students were tested in Flagler County, and 228,104 students were tested statewide. Just under 100 students now face retention in Flagler County, and roughly 43,000 students would face retention statewide. Parents have the right to opt out of testing, but last year some parents saw their children held back in part because they opted out. A group of parents sued. That case is pending review by the Florida Supreme Court. The release of third-grade reading scores late last week marks the beginning of a series of such releases over the next few weeks that run the gamut of grades and disciplines, culminating in the release of school-based and district-based grades. Flagler County has been earning a B for four straight years, after holding an A for several years. The school board has been intent on regaining a top rating. In its contract with its newly hired superintendent, James Tager, currently a principal in Volusia County, the board included a $2,500 bonus should Tager bring the district’s grade up to an A, or should he maintain that grade. But Tager is not eligible for the bonus this year, even if the district returns to A status, since this year’s results are a reflection of the tenure of Jacob Oliva. Oliva is taking a job at the state Department of Education starting June 1. (*) 2014 scores are for FCAT 2.0 assessments, which were different from the tests of subsequent years. This is a great thing if they can keep reading all the way through high school. I think some of the schools have become laptop bound. I think they need to continue to read books !